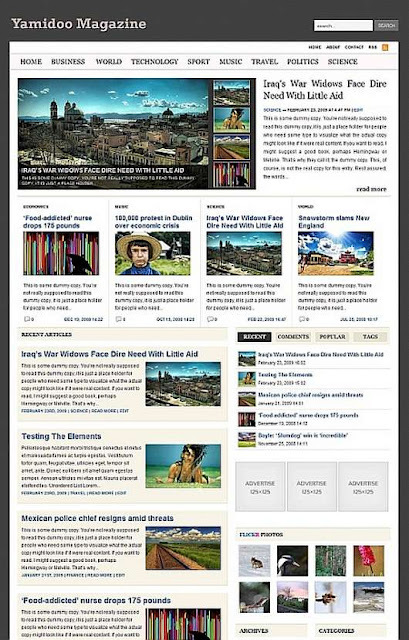 Yamidoo is a magazine style free Premium WordPress theme. The theme can be used on any niche websites even a complex news portal. This theme has a simple layout and it can be easily styled to create the perfect look for your blog. This theme has the best features. Remember, this theme is free on WordPress plat form. Therefore, when you decide to open your own blog or website, make sure that you make Yamidoo your number one option. Yamidoo has the greatest features that will not only make your website attractive, but it gives you the chance to retain your readers because of its design. Below are some of the features that you will find in Yamidoo theme. 1. The free version: this version is free and it can be used by anyone. Moreover, it can be applied on as many domains as you can. Moreover, the free version of this theme has the above features too. 2. The standard version: the standard version is bought at a one-time fee. This version is advantageous over the free version. Furthermore, the version is the best for personal projects that you have. It can also be used on as many domains as you have. 3. The developer version: this version has a one-time fee also. However, it is the best over the standard version and it is the best for client projects.